Thank you for allowing Ray Travel Resources to arrange your upcoming trip. We are doing all that we can to ensure that it is a satisfying and enjoyable one. 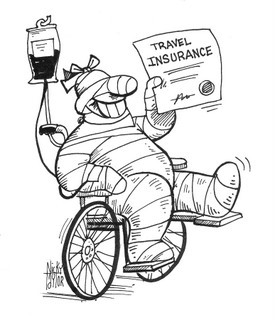 Before you go, we suggest that you take a few minutes to consider travel insurance. There are unforeseen circumstances that could mean a change in plans, or even a cancellation, and that could be expensive. Such circumstances could include an illness or emergency in your family, bad weather, a strike causing missed connections, lost baggage and travel documents, the default or bankruptcy of an airline or tour operator. Any of these situations could have costly consequences, unless you are protected by a comprehensive travel insurance policy. Look for a complete travel insurance policy offering protection for medical expenses, emergency assistance, loss of baggage and travel documents, accidental death and trip cancellation or interruption. A fully comprehensive policy will pick up where standard insurance policies lack coverage, and will add protection in many areas for which you don't have existing insurance coverage. Take the time to look over the policy to consider which coverage meets your needs. We will be happy to answer any questions or explain the coverage that will protect you for those circumstances we cannot foresee. Ray Travel Resources offers excellent short-term Medical Insurance. No age limit, pre-existing conditions ok, any nationality, any residency, all forms in English, from one day to six months!